Transform leftover Sunday pancakes into a fun packed school lunch with the help of a few simple embellishments. 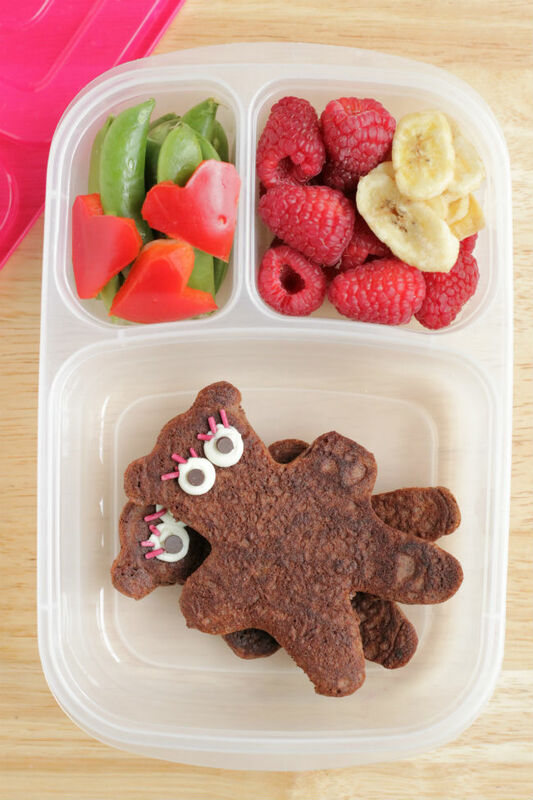 These witty Yogurt Pancakes in the shape of bears make use of pancake molds, chocolate chips, and sprinkles to break out of any school lunch rut—or to celebrate a special day. I always try to make a few extra pancakes when making weekend breakfasts. They are excellent sandwiched together with nut or seed butter, cream cheese and jam, or even a smear of applesauce for packed lunches the following week. You know, like a sandwich, but way less expected and much more fun! These Yogurt Pancakes are made with healthy ingredients to fuel your kids through their school day, but they have a chocolatey flavor that the kids will love. This chocolate pancake recipe includes yogurt for moisture, as well as probiotics and protein. Plain whole-milk yogurt works well here. The banana adds natural sweetness, so be sure to use one that has some brown spots. This recipe works with gluten-free buckwheat flour or whole wheat flour, so use the one you prefer. I used white chocolate chips and mini chocolate chips to make the eyes—simply press them onto the bears, placing the white chocolate chips first, when the pancakes are warm (or you can use this homemade googly eye version). Don’t forget the sprinkles for eyelashes. My daughter was totally delighted and surprised when she opened her lunchbox on a recent day and apparently her lunch was the star of the lunchroom. Pretty good for leftovers, right?! Mix together the banana, eggs, yogurt, ½ cup milk, and vanilla in a medium bowl. Stir in the flour, cocoa powder, baking powder, and salt. Gently fold the wet ingredients into the dry. The batter should not be super runny, but it should fall relatively easily off of a spoon. Add additional milk as needed to make the desired consistency. Heat a nonstick or cast-iron pan over medium heat. Grease with nonstick spray or butter. Drop batter by 1/4 cup portions (or bigger or smaller, depending on your preference) into circles or greased pancake molds, spreading about ½-inch thick. Cook until edges are set and you see small bubbles, about 2 minutes. Flip carefully and cook through on the other side, about 2 minutes more. To make the eyes, press two white chocolate chips onto a warm pancake. It will start to melt slightly. Once it’s softened, add a mini chocolate chip in the center and sprinkles for eyelashes. Repeat to make the rest of the batch. Serve warm with maple syrup or nut butter. Let any leftovers cool and store in an airtight container in the fridge for up to 3 days or up to 3 months in a zip top freezer bag in the freezer. Pack to enjoy in a lunch chilled or at room temp, or if at home, warm slightly to serve. This post was written by FnB contributor Amy Palanjian. Amy is the woman behind the site, Yummy Toddler Food. When she is not feeding her 5 year old easy-to-make nutritious meals, she focuses her energy on sharing those recipes with anyone who needs the help. You can follower her on Facebook, Instagram, and Pinterest.